Grits: 50, 100, 150, 500, 800, 1500, 3000 100% brand new and high quality.Sharp, wear-resistant and high efficiency. Optimal RPM 2200, Max RPM 12000.Works good for Wet or Dry polishing of stones.Perfect for Granite, Concrete, Marble, Stone, Tiles etc.Color: GrayThe back color is randomMaterial: diamond PowderPro Grade Wet/Dry, Diameter 4 inch , Height 3 MM, Backed Flexible.Aggressive and Durable made with quality Diamond Powder impregnated in Resin.Size: 100 mm/4 inchQuantity: 8pcsPlease Note: Please add water when you operate.Packaged included: 1 x Grit 50, 100, 150, 500, 800, 1500, 3000 Polishing Pads(one of each)1 piece x SuckerNote: Light shooting and different displays may cause the color of the item in the picture a little different from the real thing. The set includes 7 pieces of diamond pads: 50, 100, 200, 400, 800, 1500, 3000 & one backer pad (total 8 pieces). 1pc x backer pad. Diamond polishing pads should never been run over 5000 rpms for optimum performance. Suitable for stone marble granite glass travertine concrete polishing. Quantity: 12pcs. 11 x diamond polishing pads. 1 x polishing wheel. Material: diamond powder. Imported diamond powder, softness. Stone board can quickly achieve good gloss bright. Permacon Mondrain Concrete Pavers for Sale - Excellent Buy! 5 full skids available (95 SF/skid) additional individual units of Permacon Mondrain 80mm Richmond Grey pavers for sale. Excellent for driveways or walkways. Regular price was $565/skid, will sell for $425/skid. 9pcs x polishing pads. High wear resistance, polishing effect is good. Thread: M14. Strong grinding force and smoothness. Material: diamond powder resin powder. Detail Image. Trending at C $20.14eBay determines this price through a machine-learned model of the product's sale prices within the last 90 days. For granite, marble, concrete, ceramic. Unique resin binder, grinding power. 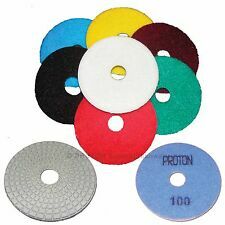 High performance dry / wet polishing pads. Diamond Polishing Disc x 10. Fast polishing and economical. Sub-Type Polishing Disc. • Usage: concrete, field stones, brick, granite, marble, etc. • Turbo cup wheel design - provides aggressive cutting action 45/50 diamond grit. • Universal 5/8" - 11 arbor size fits most angle grinders - no flanges, threads directly on the grinder. Diamond polishing pad is divided into 400#, #800, #1500, #3000, grinding followed by the use of #800, #1500, #3000 with littler water or dry polishing. Applicable models: polishing machine, grinding machine and all kinds of floor cleaning washing machine. Works great on Granite Marble Concrete Stone Granite Tile Glass etc. 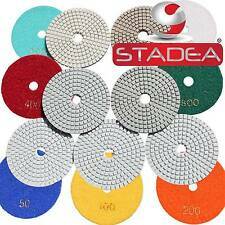 Stadea Series Standard J,4 wet dry diamond polishing pads - For Granite Concrete Marble Polishing 7 Pcs Set and one (1) piece hook and loop backing pad backer kit with 5/8" 11 T thread. Water feeding with 1/2" thread as fitting as standard. For granite marble stone tile and more. Shaft size is 1/2" gas. Designed for rough grinding and shaping. Milling tool for wet cutting. Size25 45 1/2". Thread: M14. 1 x M14 Self-adhesive pad. Quantity: 10pcs per set. 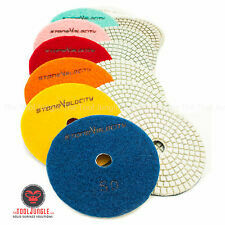 Polishing pad is mainly used for Shicai stone, glass, ceramics, the beneficiary of the. 9 x polishing pads. Material: diamond powder resin powder. STADEA is one of the preferred choices for concrete stone fabricators and manufacturers for Its top notch quality and competitive pricing. Stadea Series Super A ADC102K5/8-11 female to M14 threaded male adapter for hand tools such as grinder, wet polisher. PVA. also great for Makita GV5000 sanders. STADEA is one of the preferred choices for concrete stone fabricators and manufacturers for Its top notch quality and competitive pricing. It is designed for the following usage. About Stadea. Heavy Duty Aluminium body that will not flex under pressure, perfect for flat surface wet or dry polishing. For grinding rough concrete floor, the old Concrete Floor Restoration. Desinged for effective, efficient grinding all kinds of concrete. Use dry or wet to smooth concrete or field stone. Polishing machine, Anble grinder, floor scrubber. Our products are in use at many of the larger projects such as the HK airport and HK Disney Land. New 5 pieces set of Diamond hand polishing pads with hook loop backed. DRY or WET use is fine. Thickness : total 3mm ( 1mm Diamond coated ). 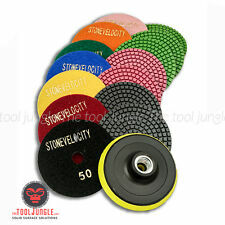 The triangular diamond polishing pads are used for FEIN MultiMaster type oscillation tools for detailed polishing of granite, marble, concrete and other types of stones. They are 3" for each side. they can be used for wet. Thickness: 3mmBacker Diameter : 4"(100mm)Pad Thread: M16 Female ThreadPad grit: 50,150,300,500,800,1500,3000Colour: grayPerfect for Granite, Concrete, Marble, Stone, Tiles etcAggressive and Durable made with quality Diamond Powder impregnated in ResinThe pad holder are with water feed hole, can be used for wet polishingRecommended RPM use is 5000 RPM or lessPackage Include:6 x 50 Girt Diamond Polishing Pad3 x 150 Girt Diamond Polishing Pad3 x 300 Girt Diamond Polishing Pad2 x 500 Girt Diamond Polishing Pad2 x 800 Girt Diamond Polishing Pad1 x 1500 Girt Diamond Polishing Pad1 x 3000 Girt Diamond Polishing Pad1 x Black yellow suckerNote: Light shooting and different displays may cause the color of the item in the picture a little different from the real thing. Integration sintered floor polishing pads make Grinding more stable. Thinner products suitable for small project. It is very sharp and gets shine more quickly. Grits: #60. Shape: 10 teeth sprial. Country/Region of ManufactureChina.